If you work on a construction site, hike, are prone to physically abusing your phone, or do anything sort of physically demanding job in a hazardous work environment, you need a rugged phone. If you're an AT&T customer or are planing to use AT&T soon, then the communication giant presents its users with two of the best rugged phones around — the Samsung Rugby and the Motorola Tundra. Both phones look and feel very similar, they cost the same and have the same set of peripherals, they also share a similar bloodline when it comes to features and functions, as they are both PTT(push-to-talk) phones that use AT&T'S 3G network to communicate. So is it simply a matter of tossing a coin and picking any one of the two? Or are there certain minutiae that may perhaps tip the balance in favor of one of these rugged, water, dust, fog, frost and ice resistant military grade phones? Samsung Rugby: The Samsung Rugby is a colorful phone, which is a good thing, as it will stand out in mud and dust. Other than that it sports a pretty standard flip phone design. With dimensions of 100 x 52 x 23 mm, and weighing in at 132 g, the phone is pretty thick, heavy and big, but palm friendly nonetheless. 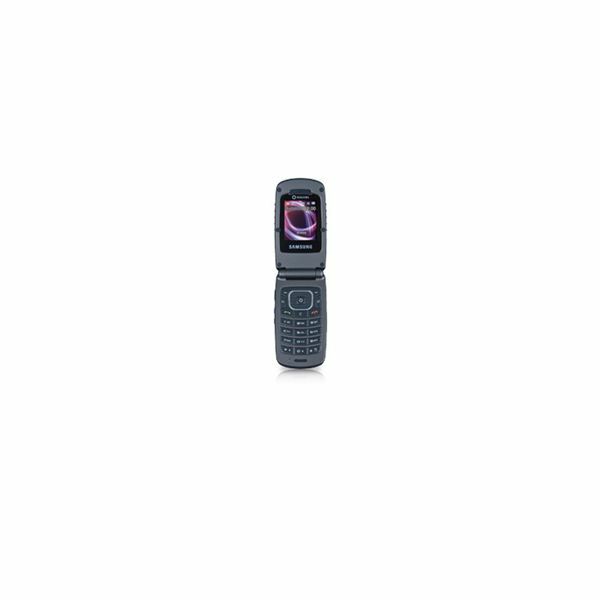 The front has a 1 inch screen capable of supporting 65,000 thousand colors and shows information such as the signal strength, date and any missed calls or messages you might have. You can customize the screen with some preset animations. You have a very small 1.3 MP camera lens as well, no flash or auto focus, but the real show stealer here is the gigantic loud speaker grill that stares you right in the face, a not so subtle hint about the phone's loudspeaker capabilities. Turning the phone over we have nothing to see, just the screw based locking system, which houses the SIM card and microSD card slots. On the left spine we have the volume rocker and PTT button, on the right spine we have a dedicated loudspeaker button and a combined proprietary charging/audio jack. Which to be honest is a real kill joy, see those earphones that come with the phone? Don't ever lose them or you'll regret it. Flipping open the phone reveals a 2 inch QVGA screen with a resolution of 176 x 220 pixels, with support for 262,000 thousand colors and a bright screen. The screen is not really bad, but the 176 x 220 resolution is a real wet-towel. The navigation pad is excellent, with two soft buttons, a dedicated web button and another dedicated web video button. You're pretty much are all set to go, and of course the mandatory Call, End call and Clear buttons are there as well. The dialing pad is well spaced and backlit, so no complaints in that department either. 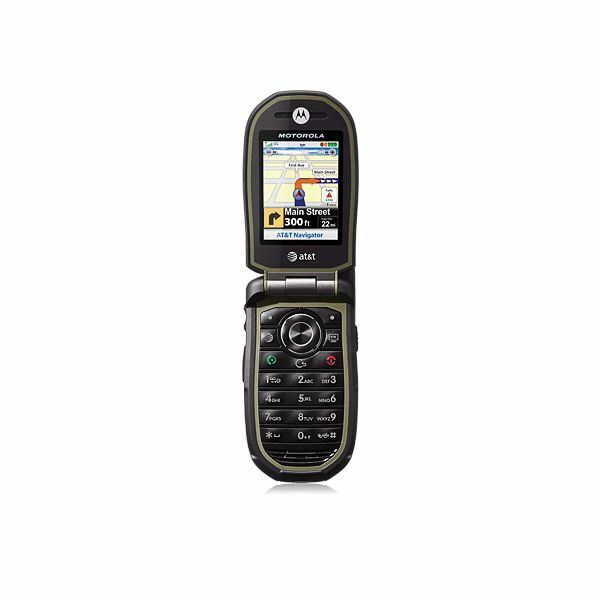 Motorola Tundra: Now for our second phone of the day, the Motorola Tundra. It has an almost identical layout to the Rugby, but it sports a prehistoric physical antenna. Though it looks out of sorts with today's phones, it does guarantee some very clear call quality and a strong call signal, both absolute essentials in PTT phones. It is also lighter than the Rugby, as it weighs 107 g and with dimensions of 98 x 53.8 x 24 mm it is also somewhat easier to grip, though not by much really. The front sports another stamp size inch display with 65,000 thousand colors that does the same exact thing the Rugby's does, with the added benefit of supporting caller photo ID. It has a bigger 2 MP camera lens (no flash or auto focus again) and no visible loudspeaker grill. At the back again we have nothing but a snap open rear cover that houses the SIM card and microSD card slots. The left spine holds the volume rocker and PTT buttons, the right side holds the dedicated camera button, on top you'll find the loudspeaker button and a button to set the ringer calibrations. At the bottom you'll find a covered microUSB port, for charging and to use microUSB 2.0 connections. Flipping the handset open reveals a 2.2 inch QVGA screen with color support for 262,000 thousand colors. What sets it apart from the Rugby is the support for the 240 x 320 resolution, a definite one up on the Rugby. Even the navigational pad seems to sport a better design, the button set up is identical to the Rugby, but they are bigger, softer and are very strongly backlit. Samsung Rugby: The user interface is a pretty simple affair. You have four assigned shortcuts via the directional button, and a tabbed, list and grid main menu setup. Things flow smoothly and without any stutter. You have a selection of games to play with (MS.Pacman, Pool 3D and Tetris), also access to AT&T's video and music streaming services, though the amount of buffer time and pixelation make watching videos on the Rugby a rather painful experience. The Samsung Rugby comes with no voice dialing capabilities, a pity really, but you do have the option to use AT&T's Video share service, and you can also make use of the on board GPS via AT&T's Navigation service. The phone book stores a maximum of 1,250 contacts, with multiple field entry that supports six fields per contact. You can assign groups, tags and even ringtones, if the available 10 polyphonic ringtones are not to your liking you can simply record your own. Messaging is adequately handled with SMS, MMS, email and IM (once Ebuddy or something similar has been installed), though there is no support of IMAP4 protocols, only POP3. Motorola Tundra: The Motorola Tundra is almost painfully similar to the Rugby, every service available on the Rugby is also on the Tundra. The only differences are the unlimited contacts entry (that basically means you can fit as many contacts as the 100 MB internal memory will allow), and multiple field entry only supports five fields as opposed to the Rugby's six. There's also a much larger selection of polyphonic ringtones, at over 25, available to choose from. Other than that it's pretty much a clone of the Rugby. But it wins out on the display, the higher resolution and better screen look wonderful on the Tundra. Communication and durability are the mainstays of both these phones, so lets us look at what these rugged phones are using to keep us in touch with the world. Samsung Rugby: The Rugby is a GSM phone which means it can be used internationally, it supports the following range of frequencies — 850, 900, 1800 and 1900, while 3G is supported via HSDPA 850 and 1900. Local connectivity is supported via Bluetooth 2.0 with AD2P and microUSB 2.0. You can use an 8 GB card, internal memory is capped at 130 MB. The phone's camera shoots some pretty decent pictures considering it's a tiny 1.3 MP snapper. Pictures turn out clear and bright with a bit of over-exposure on strong colors, as a result colors look stronger then they are and textures turn out to be smooth and bland, but there is nothing deal breaking about the camera. You get a decent amount of options to play with such as — a self-timer, brightness, white-balance, mosaic shot, panorama view, multi-shot and night modes. There is also digital zoom, though at the highest resolution (1,280 x 960) it is unusable. Multimedia is not a strong point on this phone. It will play your music files (MP3, WAV and AAC+ formats) and videos (MP4 and 3GP formats) although barely, it's really not a pastime the phone was designed to accommodate. Videos play at a maximum resolution of 320 x 240, which is thankfully higher than the phone's native resolution. But you'll hurt your eyes watching stuff on the phone. Features wise the Rugby owes most of its features to AT&T– as it comes with My Cast 5 Weather, Mobile banking, Yellowpages, MobiTV and other services. The phone natively comes with a voice recorder, organizer, voice memo, predictive text input, alarm, calculator, calendar, JAVA and GPS. Motorola Tundra: The Tundra has an identical set of connectivity options when compared to the Rugby. The only significant difference is the lower internal memory which is 100 MB. Although the official limit for this phone's external memory is 4 GB, it can easily deal with an 8 GB microSD card. Although the Tundra comes equipped with a 2 MP camera, picture quality is under par when compared to the Rugby. Pictures turn out very fuzzy and washed out, everything looks like it's about to fade, or as there is a fog hanging over the scene. Washed out pictures combined with pixelated videos shot at a low resolution make this phone worse for wear when compared to the Rugby's camera. Shooting options are the same as well. Media wise the Tundra is in the same jungle as the Rugby, same formats, same resolutions and to some extent the same music player, flip a coin over the media, you'll end up a winner/loser either way. Features wise, the Tundra is playing the clone game again, the two phones borrow and swap features with each other, but the Tundra does offer easy PC syncing and mass storage services, keep that in mind. So we have arrived at the critical juncture, do these phones do their duty in the call quality, web browsing and battery life departments? Let's find out. Samsung Rugby: Call quality on the Rugby is clear and strong, though there is a bit of white noise, background noises filters through occasionally and callers sound a bit muted. But turn on the loudspeaker and it's a whole different experience, voices sound clear and crisp, but more importantly they are very, very loud. Voices don't distort even on the highest volume, this phone is truly designed to be used in loudspeaker mode, normal calling is almost an afterthought. The signal tends to drop in very remote areas, thankfully this affects the 2G network and not the PTT functionality, though if you drop over three 3G bars even the PTT functionality goes down the drain. The web browsing experience is good, considering this is a low end phone in a super strong shell. The WAP browser loads pages in about 30 seconds on 3G, pictures are rendered badly and slowly, zooming is a pain and there is no text re-flow, you're much better off using Opera Mini on the Rugby. It's there for essential Internet needs, but not to be used on a constant basis. Battery life lasts for about two days on absolutely frugal use, talking renders it dead within 5 hours on 3G and 7 hours on 2G. The Li-Ion 1000 mAh battery does not pack much of a punch to be honest. Motorola Tundra: Call quality on the Tundra is not good, it is simply amazing. The Tundra has an ace up its sleeve named CrystalTalk+, a combination of hardware and software which utilizes a second microphone in the phone to filter and cancel out background noise. Calls sound clear, natural and loud, there is no drop in sound and no white noise whatsoever. Same goes for signal quality, the phone rarely, if ever, drops any bars, you'll be able to hold a PTT conversation easily, as long as AT&T's 3G network is present at the scene. The browsing experience is slightly better thanks to the better lit screen and higher resolution, but the WAP 2.0 browser is hardly worth swooning over. Again your best option here is to opt for Opera Mini. Battery life should have a slight edge in performance, as it comes with a bigger Li-Ion 1130 mAh battery, but talk times are 4 hours and 30 minutes on 3G and around 7 hours on 2G, the phone will last comfortably for two days on average use, so battery life is more or less acceptable. So, the Tundra scored 3 out 4, so it seems we clearly have a winner, weird thing is though, the Samsung Rugby is the more durable phone. It can take more abuse and survive longer under harsher conditions, but it seems to fall short on all other ends. So should you buy the Tundra? If you want a basic rugged phone with supreme call quality and PTT functionality, please go ahead. But if you are willing to let go of the PTT functionality, the Casio G'Z Commando is a rugged Android phone that should be given some serious consideration.